Reports from exhibitors were mixed. Some said they had great shows, signing up oodles of new dealers and distributors. Some heard only crickets and desert wind. Still and all, the bottom line is clear. With the rapid ascent of Munich High End, it is only a matter of time before manufacturers decide that one ultra-expensive show is all they can afford. Unless CES makes an effort to promote itself to the public and becomes more affordable and relevant to the industry, Munich will take its place as the show of choice (if it hasn’t done so already). Because there were fewer exhibits, I was able to visit at greater length, and often more than once, just about every marque in my category—both at the Venetian and off-site at the Mirage. Happily, there was analog playback in almost every room, so I could listen to the LPs I brought with me—not, alas, without incident. (The big bass drum thwacks on the Wilson Audio recording Winds of War and Peace gave several rooms the fantods.) This said, there were still, undoubtedly, manufacturers I missed. My apologies to them, and for any mistakes in nomenclature or pricing on rooms I did visit. Remember: I do my best (and I do good business), but I’m just one guy with a briefcase full of blues, rock, and classical and even in its somewhat diminished state CES is large. I’m going to start on the 35th floor, where Kharma was showing its beautiful, four-way, seven-driver (one 1" diamond tweeter, two 2" diamond mid/tweets, two 7" Omega-F carbon-fiber midranges, and two 11" Omega-F carbon-fiber woofers in a D’Appolito array), $437k Enigma Veyron EV-2 floorstander with ported, CNC-milled, “bullet-wood” enclosure, I heard this same speaker sound fabulous in Breda just two weeks before the show, driven by Kharma’s own electronics; here it was being driven by Lamm Industries ML2.2 monoblock amplifiers, LL1.1 Signature linestage preamp, and LP1 Signature phonostage, and sourced by EMM Labs digital and a refurbished EMT 927F turntable with SME 3012-R tonearm and Ortofon A95 cartridge. All cabling was from TchernovCable. 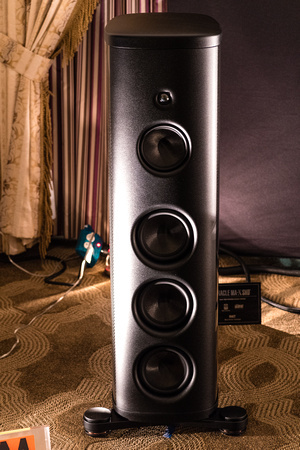 The sound was lovely in timbre, very spacious, and fuller in the power range than what I heard in The Netherlands, but also darker in balance, less finely detailed, considerably lower in energy, and lacking the very deepest bass compared to the sound with Kharma’s own gear. While Rachmaninoff’s Symphonic Dances [Reference] had gorgeous string tone and tremendous stage width and depth (signal virtues of the Veyrons), the bass was also a little too full with some slight vagueness in imaging (which could have been room effects). All in all, this was a beautiful but relatively low-res, low-energy presentation vis-à-vis Breda. 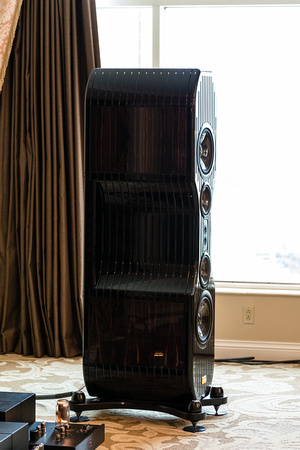 Still on the 35th floor and right next door, Kharma was showing its $225k, five-driver (one 1" diamond tweeter, two 7" carbon-fiber Omega-F midranges, and two 11" Omega-F carbon-fiber woofers in a D’Appolito array), three-and-a-halfway Exquisite Midi Grand floorstander with ported, CNC-milled, bullet-wood enclosure. Driven by Lamm Industries wonderful ML3 SET monoblocks, LL1 linestage, and LP1 phonostage, and sourced (once again) by EMM Labs digital and EMT/SME/Ortofon analog (cabling was from TchernovCable), the Exquisite Midi Grands had terrific impact on piano and tighter bass than the Veyrons. Though not quite as liquid or refined in the treble as the more expensive Kharmas, the Midis were still pretty damn beautiful-sounding, reproducing the winds and brass on the “Liberty Fanfare” from Winds of War and Peace [Wilson] with dark, rich tone color and excellent grip and impact on that big bass drum. For whatever reason, the Midis had better image focus than the Veyrons, though their stage was not quite as big as that of the other Kharma system. They were better defined in the low end, for sure. This was a superior presentation, and the system sounded even more lifelike on the third day of the show, on a Prestige mono LP of Ben Webster’s tenor sax, which was reproduced with gorgeous timbre and considerable realism. 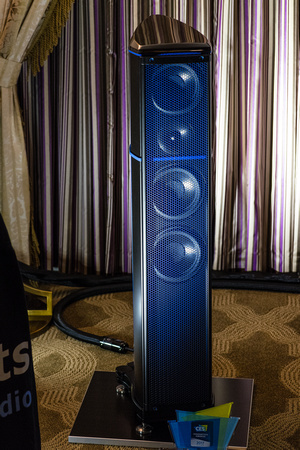 Elsewhere in the big suites on the 35th floor, YG Acoustics debuted its $266k, four-piece (two main towers and two sub towers), twenty-driver (eighteen BilletCore aluminum woofers, mid/woofs, and midranges, and two BilletCone aluminum tweeters), four-way, flagship Sonja XV floorstanders in sealed aluminum enclosures. Driven by Audionet’s aptly named Heisenberg monoblock amplifiers, Stern stereo linestage, and PAM G2 phonostage, and sourced by a Kronos Pro turntable with AirTight Opus 1 cartridge. (All cabling was Kubala-Sosna Realization.) On my first listen on Thursday morning, the sound couldn't have been more different than that of the Lamm/Kharma room. This was an altogether drier, leaner, more solid-state presentation. Though not at all liquid on string choirs, the system was far higher in resolution and more present, albeit less spacious, than the Lamm/Kharma systems, reproducing The Band’s “King Harvest” with extremely crisp detail and excellent timbre on voices. When I returned later in the show, the presentation was transformed (due in part to a change in Audionet amplifiers), sounding more gemütlich on Sinatra at the Sands, The Band, and Julie’s El Vy LP (which we listened to almost from start to finish). Gone were the solid-stage leanness, forwardness, and deracination of tone color. In their place was a big, dark, beautiful sound with immensely improved density of color in the power range and the bass, and a huge stage. Though the Sonja XVs might’ve benefitted from more power/current, they still made quite a memorable debut. From the penthouse suites we descend to the 29th floor, where the first system I ran into was the three-way, three-driver (beryllium tweeter, carbon-fiber midrange, carbon-fiber woofer), $26.5k Rockport Technologies Atria II floorstander in a raked, ported, triple-laminated, constrained-layer-damped enclosure. Driven by Nagra’s Classic INT integrated (Nagra had a particularly good show), sourced by AMG’s V12 turntable with AMG 12JT "Turbo" tonearm and a DS Audio DS 002 optical cartridge (with DS 002 phonostage), the Atrias were simply superb on The Band’s “King Harvest” [MFSL]—vocals, bass, guitar, piano, organ, everything. I didn’t really like the original iteration of the DS Audio optical cartridge, but this one! Folks, the way it separated out and resolved Richard Manuel and Levon Helm’s harmonies on the choruses of “King Harvest” simply had to be heard to be believed. Both singers were so clear, distinct, and lifelike it sounded as if they were separately miked and equally mixed. The entire system provided superb delineation of detail without any loss of color or thinning down of the power range and bass, and with a spaciousness—on The Weaver’s “Goodnight Irene,” for example—that the original DS Audio cartridge could only have dreamed of supplying. 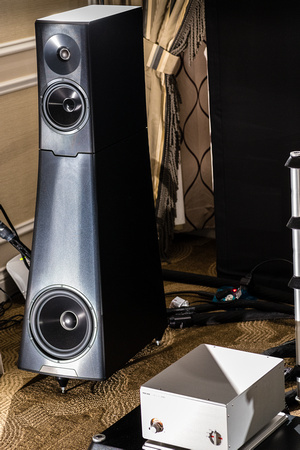 The gorgeous, $70k, three-and-a-halfway, six-driver (one concentric crystal-membrane/AMT JET 5 mid/tweeter, one crystal-membrane midrange, four side-mounted aluminum-sandwich woofers) ELAC Concentro floorstander driven by Constellation electronics, and sourced by a $2.5k ELAC record player (!) sounded just as phenomenal in Vegas as it did in Tokyo. One of the most impressive loudspeaker debuts in recent memory, the Concentro is an incredibly full-range, astonishingly natural speaker in a big box with a small-box disappearing act. It supplied superb timbral weight top to bottom, sensational transients, and very deep bass on everything from the Weavers to The Band to El Vy. And it played limitlessly loudly without a hiccup. This is a must-review transducer. 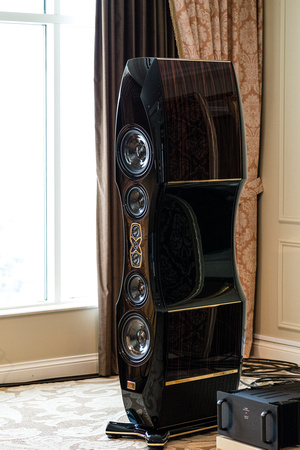 The $58k, five-driver (one 1" beryllium tweeter, one 6" graphene midrange, and three 10" carbon-fiber woofers), three-way Magico S7 floorstander in a sealed aluminum enclosure was being driven by top-line Soulution Series 7 electronics, sourced by Soulution digital and De Baer analog, with cabling from Kubala-Sosna and stands from Critical Mass Systems. The Band’s “King Harvest” sounded fine on the S7s, though to be honest not as fine as the same cut sounded on that incredibly 3-D DS Audio/AMG/Nagra/Rockport system; the S7s were also quite satisfactory on a Neil Young digital track, though this music didn’t present much of a dynamic challenge. Overall, there was a touch of leanness and aggressiveness to the S7’s presentation that rather mystified me, as neither of these things are typical of Soulution or Magico. 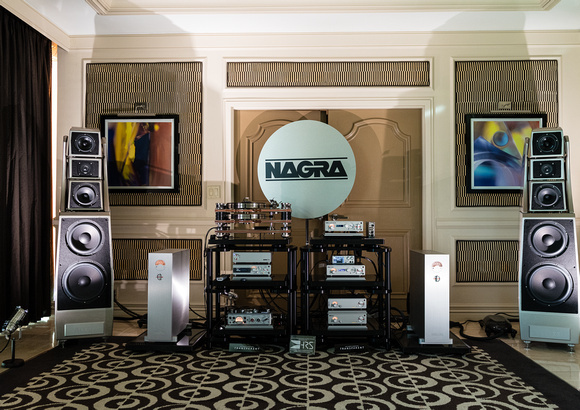 However, Magico more than made up for any S7 room/set-up foibles with its fabulous $75k, three-way, five-driver (one 1" diamond-coated beryllium tweeter, one 6" graphene midrange, three 7" graphene woofers) M3 floorstander in a sealed aluminum-and-carbon-fiber enclosure. Driven and sourced by Constellation’s new Performance Series electronics, wired by MIT, and supported by Critical Mass Systems QXK stands, the M3 sounded fantastic on a recording of Liszt’s Années de pèlerinage with Israeli/Dutch pianist Yoram Ish-Hurwitz. This was simply the best reproduction of piano I heard at the show—and on a 44.1kHz CD, no less. (I’m not as wild about high-res digital as some on our staff. To me it almost always sounds a bit “top-down” in balance—more spacious and airy and finely detailed in the upper mids and treble, yes, but somewhat thin and deracinated in the power range and bass compared to CD.) The M3 is, IMO, the best speaker that Wolf has made because of its combination of classic Magico virtues and its newfound lushness of tone color. On the 30th floor, Raidho was showing its three-way, seven-driver (one sealed-ribbon tweeter, two 100mm diamond midranges, four 115mm diamond woofers) D-4.1 floorstanders driven by Aavik Acoustics P300 stereo amp and C300 preamp. (All wiring and power conditioning was from Ansuz Acoustics.) The sounds was lovely on The Doors’ “Riders in the Storm” and on Miles’s rendition of “Time After Time”—a warm, dark, liquid presentation that was not (as has sometimes been the case with Raidho multiways) overblown in the bass. Oh, the speaker might have been a little recessed in the mids, but it was still gorgeous in timbre with one of the best treble ranges in high-end audio and superb transient response. 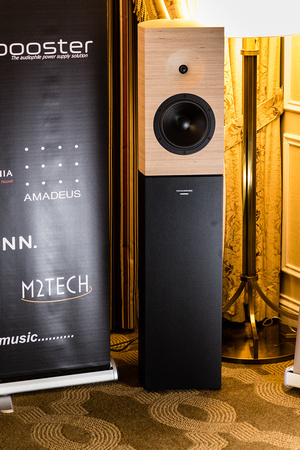 French audio manufacturer Amadeus showed a “consumer” version of its $50k Philharmonia by Jean Nouvel stand-mounted, two-way, powered, DSP’d loudspeaker sourced by a Lumin S1 streamer/renderer/DAC and wired with Esprit Audio cable. This speaker made a spectacular debut in Munich—sounding huge, fast, deep-reaching, and very finely resolved, with a near-complete disappearing act. Alas, parked in the corners of a smallish Venetian hotel room, it was not as impressive, getting zero staging and tubby bass (compared to Munich). Still and all, a digital recording of the Emerson Quartet playing Bartók’s Fourth Quartet had natural bite and excellent articulation on all four instruments with good reproduction of the cello. Sonics were crisp and clear—not the warmest I've heard but still exciting. In a more congenial room, the Philharmonia is a great loudspeaker, the most promising two-way I’ve heard since the Magico Mini. But even it couldn’t conquer the Venetian at its worst. The venerable, $70,500 omnidirectional MBL 101 E MkII, on the other hand, driven by Juergen Reis’ new MBL electronics (N31 DAC/CD player, N11 stereo preamplifier, N15 monoblock amplifiers) and wired with Wireworld Eclipse 7 cabling, sounded better than I’ve heard it sound in years. 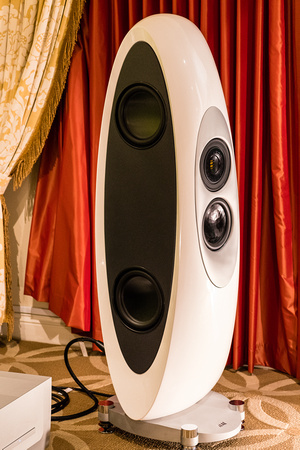 Simply wonderful on the “Overture to Candide” [Reference], it pulled off as complete a disappearing act as (and generated a more three-dimensional soundfield than) any other speaker at CES—reminding me of why I feel in love with Radialstrahlers in the first place, lo these many years ago. With lovely timbre on strings, fabulous 3-D soundstaging and imaging (though a Radialstrahler’s imaging will never be as dead-centered or tightly focused as that of a director radiator), this was simply a fabulous presentation, as realistic and musical as anything at the show. Driven by Ypsilon electronics (Phaethon integrated amp and VPS-100 Valve phonostage), sourced by a Thales TTT Compact II turntable and Ikeda KAI mc cartridge, and coupled expertly to WB's $12,500 Torus sub, Wilson Benesch’s new four-driver, 2.5-way, $38,800 A.C.T. 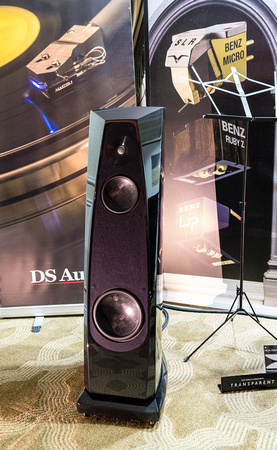 One Evolution P1 floorstander with advanced polypropylene drivers in a superior carbon-fiber cabinet provided what was, perhaps, the most neutral presentation I heard at the show, with very natural timbre, imaging, and staging thanks to a superior disappearing act. 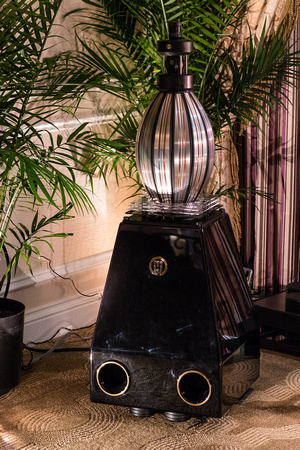 Save for a slight blunting of transient detail in the mids and a slight reduction of color and impact in the bass and power range that robbed the presentation of a bit of dynamic spark (on Melody Gardot’s “Who Will Comfort Me,” for instance), this speaker came close to sonic greatness. Powered by topline VTL electronics (S-400 Series II Reference stereo amp, TL-7.5 Reference linestage, and TP-6.5 Signature phonostage) and sourced by a Brinkmann Balance turntable with 12.1 ’arm and Lyra Etna cartridge, the $25,500 Wilson Audio’s Yvette three-way sounded swell on The Band’s “King Harvest”—with superb control and definition in the bass, slightly recessed mids, and softish, anything-but-beryllium-aggressive treble on Levon Helm's cymbals. The Yvette was also quite impressive on Winds of War and Peace, with genuine clout on the bass drum, and just plain gorgeous on a violin and guitar transcription of Schubert. The Yvette is clearly superior to previous Wilson three-ways of the same size and price, and proof positive that Daryl Wilson has just as great an ear as his celebrated dad. Piega showed its $25k Coax 711 three-ways with coaxial ribbon tweet/midrange and four mid/bass cone drivers in an aluminum enclosure, Powered by Air Tight electronics (including AT’s new ATE-X phonostage), the Piega produced a very neutral sound à la Wilson Benesch—really quite superb on The Band, though not the ultimate in resolution on Helm and Manuel’s voices. Nonetheless, the Coax 711 had an uncolored openness that was quite distinctive. One of my faves, Zanden Audio, was showing its Model 9600 monoblock amplifiers and new 3000mk2 preamplifier with Kharma’s $37,500 dB-9S three-way floorstanders, sourced by a Grand Prix 2.0 turntable with Tri-Planar 12" ’arm and Air Tight PC-1S cartridge. This was a lovely-sounding exhibit with rich timbre and excellent articulation of detail on Kind of Blue, wonderful dynamic life, solid bass (great kickdrum), and realistic tone color on The Band, and lovely air around all voices and instruments (and this in a small room). YG Acoustics’ $42.8k three-way Hailey 1.2, driven by Nagra Classic monoblocks, Classic preamp, and Classic DAC, with VPS phonostage, Brinkmann Bardo ’table and Brinkmann cartridge (wiring was by Tara Labs), was simply outstanding on The Band LP, with terrific articulation on Manuel and Helm’s voices and really solid and prominent bass. 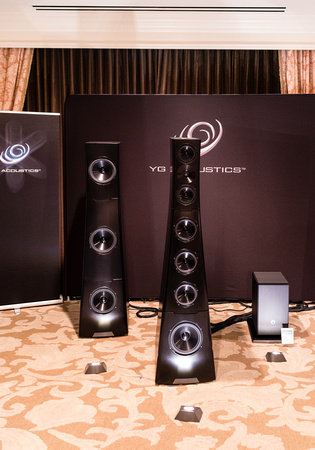 In some ways this was YG’s best effort at CES—a wholly superior presentation. 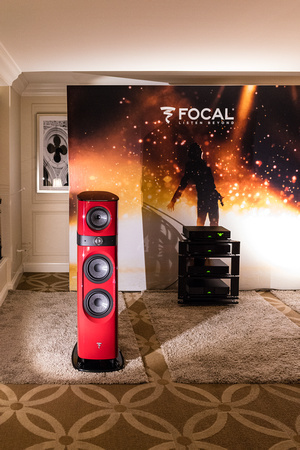 Focal showed its $20k Sopra 3 three-way in an articulating cabinet with Naim electronics. Smooth and rich in timbre on digital, it was no less superb spatially with an unusually deep low end marred by just a touch of midbass boom where I was sitting. We come now to the end of the line at the Venetian, but not to the end of the show. Across Las Vegas Blvd. 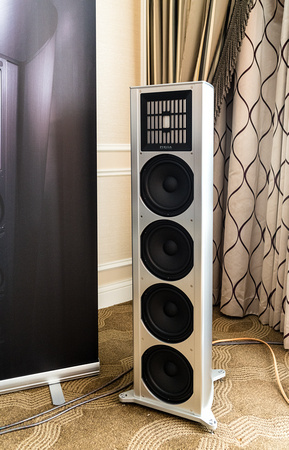 at the Mirage, Wilson Audio was showing its giant, five-driver, four-way Alexx with articulating cabinet, driven by D’Agostino electronics and sourced by dCS digital. This was, quite simply, the best I’ve heard the Alexx sound—and on a Johnny Cash cut the most realistic vocal I heard at the show. The system was no less impressive on instrumentals, making it a clear Best of Show contender. Down the hall in the Nagra suite, the Wilson Audio Alexx was being shown with, uh, Nagra electronics, and it was merely the second-best I’ve heard this speaker sound—and not second by much. The system was simply phenomenal on Rene Laflamme’s reel-to-reel tape of guitar and stand-up bass with tremendous density of tone color and superb transient response. Digital was also exceptional in this room, making it another Best of Show contender. Well, that depends on the music and the instrument(s). For solo voice, the Wilson Audio Alexx with D’Agostino electronics and dCS digital. For piano, the Magico M3 with Constellation electronics and source For guitar, the Wilson Audio Alexx again with Nagra electronics and tape player. For saxophone, the Kharma Exquisite Midi Grand with Lamm electronics and EMT/SME/Ortofon. For exceptionally realistic imaging, the Rockport Atria II with Nagra electronics and AMG/DS Audio DS 002 source. For overall soundstaging and three-dimensionality, the MBL 101 E MkII with MBL electronics. For musicality and easy listening, the YG Acoustics Hailey with Nagra electronics and Brinkmann turntable/cartridge. Take your pick. There isn’t a loser in the bunch. 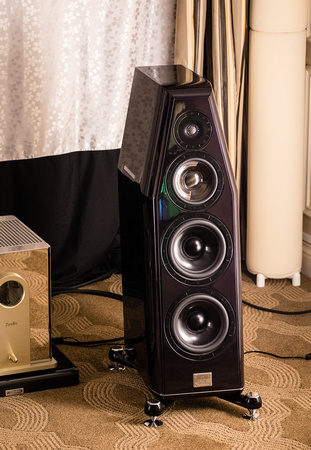 Sandy Gross’ GoldenEar Triton Reference. 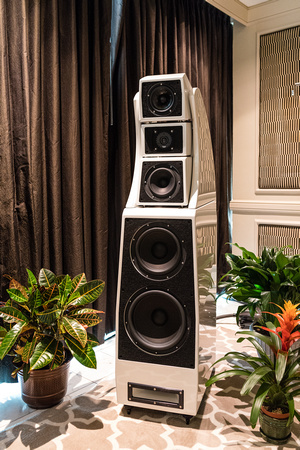 A whole lot of loudspeaker for $8500. Four-Way Tie: YG Acoustics Sonja XV, ELAC Concentro, Rockport Atria II, and Wilson Benesch A.C.T. One Evolution Pi.